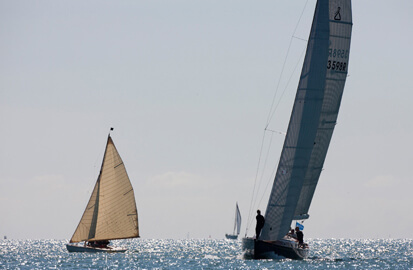 July 16th – 23rd 2010, Cowes. 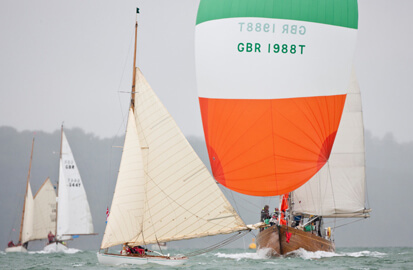 The newly launched St Patrick participated in this year’s Panerai British Classic Week. Helmed and crewed by a team from G.L. Watson & Co. St Patrick had something of an awakening when being delivered to Cowes from Hamble in a Force 5 gusting 6. The crew had much to learn after only having previously had a short shake down in light airs, but the boat behaved excellently from the start. Enjoying the kind of temperamental conditions which only the Solent in July can offer, St Patrickwas raced hard in everything from calms and blistering heat to Force 6 and driving rain. Racing in Class 4, competition was found amongst others from the similarly rated William Fife designed Jap. This made for some superb close racing with St Patrick frequently creeping into the fleet of class 3 in front. The crew had an excellent regatta, bettered only by the pleasure of learning to sail such an authentically restored yacht like St Patrick and getting the most out of a hull and rig which enjoyed a first outing in their original form in over 50 years. St Patrick finished a respectable 10th out of a 20 boat fleet, winning the British Classic Yacht Club’s “Je ne sais quoi” award for best yacht in Class 4. We look forward to racing St Patrick again and in the meantime welcome all enquiries.